How do you answer that question? “Bring him back” “Turn back the clock” “Make me feel better”? The truth is, it’s hard to do anything. The person you really want to talk to, to share the jokes with, to check in with, is the one person who isn’t there. And you feel very alone, even if you’re surrounded by people. Jennie has answered. She has asked people to bake a pie, for Mikey, today, the day of his memorial. A peanut butter pie, which was his favorite. To share that pie with loved ones, because she wishes she could share this pie with him. As I mentioned before, I consider Jennifer a virtual neighbor. The Nuni is the same age as her younger daughter. We’re both working moms, with young kids, trying to cook for our families, to raise them with authentic food. Though we live 3,000 miles apart, through the magic of the internet, we chat as if we lived 3 blocks apart. As if our lighthearted dinner invitations could be accepted on a whim. As if I could run over to borrow a cup of sugar, to share a cup of tea, instead of just running to her site for a recipe. And I wish with all my heart that I could just show up, with that cup of tea, and be there for her today. I can’t show up, but she asked for this. So it’s the very least I can do. I woke up this morning at 5 am, and before I left for work, I made this pie. For Mikey. For Jennie. For their beautiful girls. And for my family. Jennie expresses love through food, and I do the same. I’ll share it with my darling daughter and my beloved husband, but I’ll also share it with my neighbors, over a casual dinner, a glass of wine. And wish that Jennie were sharing it with us. I hope that this small show of support makes her feel just a little less alone. 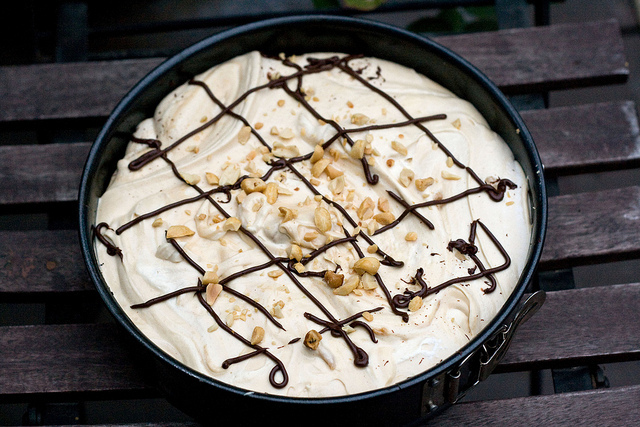 The recipe for peanut butter pie can be found on Jennifer’s site here. Make it for your loved ones, and give thanks that they are there to share it with you. I don’t know Jennie, but I have a friend who’s only dessert like is peanut butter cookies and ice cream. I’m going to make this for him 🙂 I just now opened tastespotting, as I do when I’m in the mood to peruse food, and the first page is just filled with bloggers who made this pie (or their version) for Mikey. So lovely to see that.